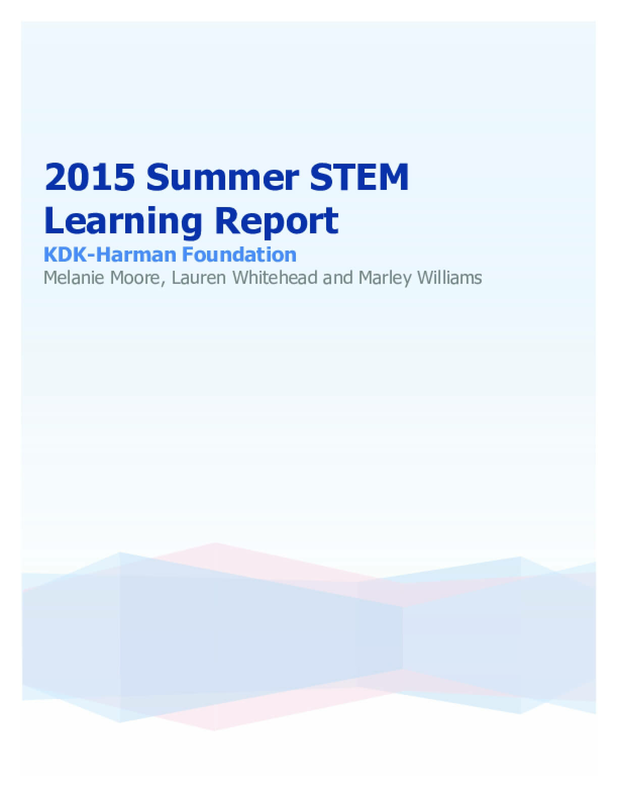 The KDK-Harman Foundation began its Summer STEM Grant Program in 2011 with a goal of combating summer learning loss, especially for economically disadvantaged students in Central Texas. For the past three years, 2013, 2014, and 2015, the foundation dedicated the majority of its grants budget to Summer STEM programs, using more than half the grants budget each year. This year was the inaugural year of the Summer STEM Funder Collaborative (SSFC), a coalition of nine funding organizations committed to growing high quality STEM programming in Central Texas. The foundation created this report to compile observations, share its findings and questions with a larger local audience; spark conversation; and further the local work on program quality, student outcomes, cross-sector collaboration, and system building. Copyright 2015 by KDK - Harman Foundation, 3736 Bee Caves Road, Bldg 1., #155, Austin, TX 78746 . All rights reserved. No part of this report may be reproduced in any manner whatsoever without permission except in the case of quotations embodied in critical articles or reviews. For information write to: Permissions, KDK - Harman Foundation, care of the above address.